Preheat over to 350º. Place apples in a baking dish, spoon brown sugar over cores; add 1/4" water to the bottom of the dish and cook until softened, about 45 minutes. In a large pot, warm cider, ale and sherry with cinnamon stick, clove, allspice, ginger and nutmeg over low heat, being careful not to boil. Simmer for 30 minutes, then add apples and baking liquid. 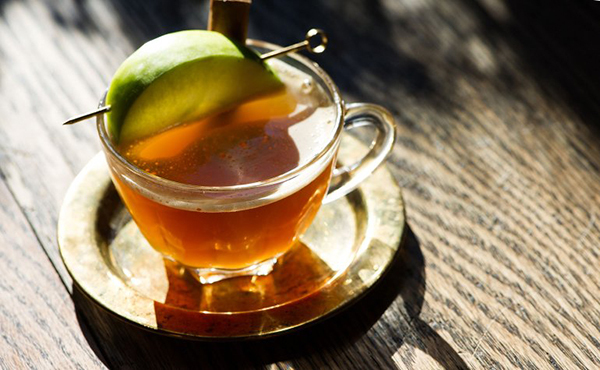 Ladle into mugs or handled glasses; garnish with an apple slice and cinnamon stick. Notes: This recipe is perfect for a crowd coming in from the cold, and can stay warming on the stove (or in a crock pot) the whole night through. While it is a little labor-intensive at the start, just think how easy hosting will be if every helps themselves to wassail–cheers!